Calf muscles are notoriously difficult to grow in the gym, to the point where many people give up and stop trying. What makes the calves so stubborn? It turns out the lower leg muscles aren’t meaningfully different from other skeletal muscles. What makes them hard to grow is that they’re already well developed from walking around every day. The average American walks between 5,000 and 7,000 steps in a day, so it’s no wonder that doing a few sets of 10-20 reps of calf raises doesn’t make a big difference in calf development. I’d estimate that our calves are developed to about 80% of their potential size just from walking around, so additional training is really about chasing that last 20%. A 20% increase in calf size (cross sectional area) from hard and smart training only amounts to a 1-2 inch gain in circumference, so don’t expect to grow your 15 or 16 inch calves into 20+ inch monsters! 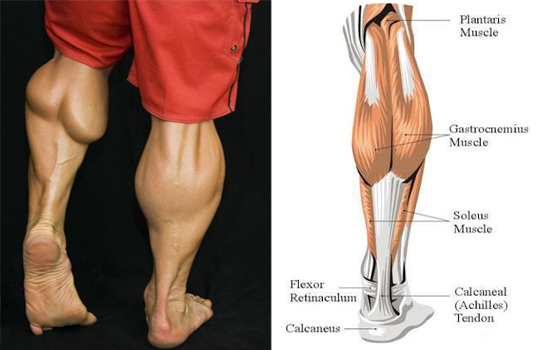 Maximum calf size, just like any other muscle group, is largely genetic. Those with naturally large calves don’t need to do anything for them in the gym – they’ll look impressive just from walking around and keeping bodyfat low enough to see definition. Those with naturally small calves will need to train them hard and smart to gain that extra 1-2 inches and work their way out of the bird leg category. Since our calves receive a lot of stimulation from walking around, your best training results will come from stimulating them in ways that differ from walking. Here are several approaches that work. Try them out and see which ones work best for you or incorporate all of them into a routine. Full range of motion – since walking involves only partial range of motion at the ankle, your calf training should incorporate a full range of motion. Go all the way up and all the way down when you do your calf raises (but avoid relaxing at the bottom which stresses the connective tissues). If you walk for exercise, try walking up hills or incline the treadmill. The incline will increase the range of motion at the ankle to stimulate calf growth. Big muscle pump – forcing a large amount of blood into a muscle is one way to encourage growth. The best way to get a good pump is with high reps (20-50) and short rest (30-60 seconds) in between sets. Heavy weight – each of your calves is used to pushing your full body weight forward as you walk. To stimulate growth through high resistance, you should load significantly more than your bodyweight onto the calf machine at the gym. Arnold and his bodybuilding idol Reg Park grew their calves by doing standing calf raises with 500+ pounds. Another option is to use less weight on the machines but lift with one leg at a time. If you walk for exercise, try walking with a weighted vest. Heavier people generally have bigger calves. Walking regularly with a weighted vest or backpack will help you develop the calves of a heavier person. Slow eccentrics – try doing some of your calf exercises by lifting with both legs and lowering slowly with one leg. Use 60-80% of the weight you’re capable of lifting with both legs. These eccentric reps create a lot of stress on the muscle, so I recommend doing them at most every other week. Variety – use a variety of exercises to work your calves from different angles. Exercises where your body is flexed at the hip, such as donkey calf raises or calf raises on a leg press machine, anecdotally provide great results. Exercises where your leg is flexed at the knee, such as the seated calf machine, put more emphasis on the soleus muscle. The soleus is comprised mostly of slow twitch muscle fibers, so use higher reps on that exercise. As a bonus, all of the above mentioned exercises produce less spinal compression than the more common standing calf raise. Calf raise on leg press machine – 5 sets of 10-15 reps heavy with 2-3 minutes rest between sets. Every other week do some slow single leg eccentric reps. Standing calf raise – 5 sets of 20 reps with 60 seconds rest between sets. Strive for full ROM. Seated calf raise – 3 sets of 30-50 reps with 30 seconds rest between sets. Strive for full ROM. 30 minute walk on a treadmill at 10% incline with weighted vest. Start with no vest and work your way up to a 40 pound vest as you get stronger. Train hard and good luck with those bird legs!